[POP ART - PETER MAX]. The Art of Peter Max. Signed and inscribed by the artist Peter Max to actress Gena Rowlands. 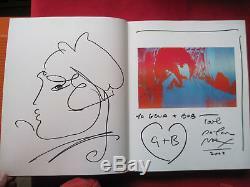 Inscribed: To Gena & Bob, Love Peter Max, 2002. Next to a drawing by Max of a heart with G & B in its center. With an original full-page sketch by Peter Max in black felt pen on the opposite page of a womans head in profile. Oversize coffee-table art book chronicling the life and art of internationally famous modern artist, Peter Max, best known for his colorful kaleidoscopic and often whimsical paintings. Fine fresh copy in a fine bright dust jacket. The lovely Gena Rowlands is perhaps best known for her work with her late husband, director, writer, and actor John Cassavetes, with whom she made ten films, including Faces and Minnie and Moskowitz. She has enjoyed a prolific and acclaimed career on Broadway, in television, and in such contemporary films as Another Woman, Hope Floats, Taking Lives, The Notebook, Skeleton Key, and Broken English. She was nominated twice for Oscars for Best Actress in a Leading Role in Gloria (1980) and A Woman Under the Influence (1974). 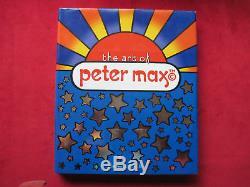 The item "Art of Peter Max SIGNED BY PETER MAX WITH DRAWING" is in sale since Saturday, November 20, 2010. This item is in the category "Books\Antiquarian & Collectible". The seller is "catstarbuck" and is located in Santa Barbara, California. This item can be shipped to North, South, or Latin America, all countries in Europe, Australia, Japan, South Korea, Indonesia, Taiwan, South africa, Hong Kong, Israel, New Zealand, Singapore, Saudi arabia, United arab emirates, Qatar, Kuwait, Bahrain, Malaysia, Bangladesh, Brunei darussalam, Egypt, Jordan, Cambodia, Sri lanka, Macao, Maldives, Oman, Pakistan, Reunion.